Thus sophistry is directly contrary to the intellectual tradition of philosophy and of Socrates and Plato who saw themselves, not as possessing wisdom, but as pursuers of wisdom. Instead, in the philosophical tradition wisdom was not something that could ever be possessed by mortal man, no matter how vigorously the philosopher pursued it. So, while the sophist is fueled by the ambition to possess knowledge, the philosopher treads down an endless road, and the fuel that burns in his heart is wonder: wonder at the world, at creation itself – and hope. The sophist sees the world through a microscope: reducing creation to numbers and chemicals and mass and wavelengths. The philosopher, in that experience that we’ve all felt at some time in at least some small way, transcends the environment of the sophist and finds wonder in the world, and in the philosopher’s heart burns with the hope of expanding this enlightenment – not to dominate the world, but to see it in ever greater circles of experience. The philosopher tries to conform himself to the world but the sophist seeks to conform the world to himself. Thus, the philosopher grasps a reality that expands to infinity, and is far more human, more fulfilling, than that finite environment of the domineering sophist. The sophists of Socrates’ epoch are long gone. However, today we have our own brand of sophists and perhaps nowhere is its paradigms more concentrated than within the new atheist movement. Like the archetypal sophists the New Atheists have built their worldview on the dominion of knowledge rather than its wonder. The logical conclusion of this pursuit to dominate our environment is to reduce the world to what we can touch, see, smell, hear and taste because anything existing beyond our senses transcends the realm of what can be proved or disproved. Thus, the scientific method is, not just a tool, but the very lens by which the new atheist sees and interprets everything. We cannot conduct a reproducible experiment proving God’s existence therefore he must not exist. We cannot see or touch any spirit or soul or “heart” of man so therefore everything we know as “consciousness” or “free-will” or anything seemingly transcendent must just be chemicals and electrical signals in the brain. There can be no higher purpose except the replication of our own DNA – and everything we do was programmed by billions of years of evolution to function towards that end. I can’t help but think that the great old minds of the last epoch, Socrates and Plato, would laugh at such assertions. The new atheists’ worldview has an internal consistency – but then so does the worldview of a deranged lunatic. No, the folly of these sophists is their attempt to define the world according to arbitrarily selected rules, rules that, on their own, serve only the bend the world to the will of the sophist. New atheists readily adhere to the laws of science but vociferously condemn the laws of philosophy and theology. Instead, they opt to create the false dichotomy between science and religion – but the wholeness of truth requires both. Thus, they shout: thou shalt not believe or even entertain any idea not of science! The true philosopher, however, does not exert such preeminent rules to define reality but instead allows reality to define him. We cannot know the whole truth of the world by containing ourselves to science because what we can perceive through our senses represents only one part of the human experience. Much of human experience, perhaps even most of it, cannot be viewed under a microscope and it cannot be quantified. 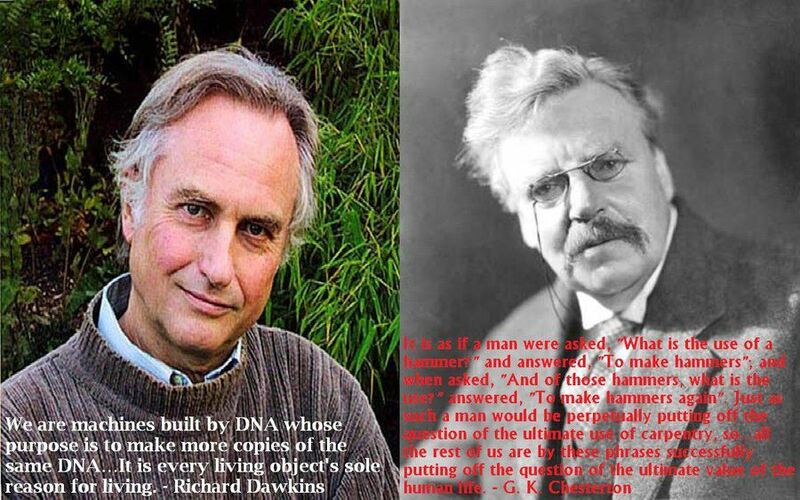 The best that the atheists can do to explain our more transcendent experiences is to conceive elaborate stories about how building temples to sky-gods and praying to the ether somehow help the DNA replicating process, or to dismiss such experiences as “mistakes” in our genetic code. Of course, to talk of mistakes presupposes intentions which in turn require some conscious being in control, but just ignore that part. If you could see God, touch God, feel God, if you could prove his existence using the scientific method then all the birds and fishes and animals of the earth would be theists and every Sunday they’d gather and worship Him like the human believers do. But they do not worship, except by their existence, they do not pray and they do not construct religions or churches. But neither do they write ballads, paint the landscape or philosophize like we do. They cannot conceive of beauty like us for the same reason that they cannot worship like us: because they are just animals and we are not and because beauty and worship are intrinsically connected, flowing from the same well. We have souls; we have hearts. No, we have animal bodies but we are souls. We transcend what we can taste and smell and touch and hear. We transcend the world of functionalities to pursue things with no function. A man does not let his imagination run wild and write sonatas in order to pass on his genes; he does it for the joy of it. The object of festival is festivity. It serves no higher purpose because it is the purpose. And what higher form of festival is there than worship? Our DNA can never tell us to worship God and we cannot be programmed like machines to be like Him, to create and love and laugh like silly little gods. God wrote the genetic code in our bodies that tells us to breathe and eat and replicate but what is even more amazing is that He wrote a poem in our hearts. We transcend the machinations of DNA replication because God is a poet and the poem demands by all that is good that man be more than beast, and so he is. It is precisely those functionless acts of man that speak of God. If everything we are and do is determined by our genes and our genes are determined by the evolutionary process then everything that we do and are must have a function, everything we do must function to further our lineage, to give us some advantage in passing on our genes. And, yet, man constantly behaves in ways that have no function. Humanity sings and dances and is festive; we laugh; we create art; we philosophize. In our culture of constant work all of these things can be, and have been, reduced to serve certain functions: the “philosophy” of political theory serves political agendas, modern art serves some men’s sense of superiority, night clubs serve to keep the working class contained and to allow them to “unwind” from their work. But political theory is not philosophy, modern “art” is not art and there is no song or dance in a night club. Oh, some remnant is there, but they are shadows. Leisure, festivity, in its truest form is without function: it exists for its own sake and men partake in it merely for the joy of it. Science could never create such a world. Only God, who is the first and last, who exists simply for his own sake and who loves us and creates universes simply for their own sake could ever conceive of such a world. Of course, none of this is proof of God. But that’s the secret that drives the atheist mad; no proof is needed. If an omnipotent, omnipresent, omniscient being exists how will science detect it? There is no way. God created our senses, he created light and mass and matter. He created all of time and space and He is bigger than the universe. Every discovery of science detects some small part for God but it can never see all of Him because science is contained by the physical world and he is even larger than that. It would be easier for an amoeba to see a man than for man to see God. That is why theism is a leap of faith, not because we’re irrationally choosing to believe in some make-believe old man that isn’t real but because we are very rationally choosing to believe in something even more real than ourselves. The atheists who claim that the belief in God is actually a scientific hypothesis which they can test and disprove are like germs claiming that a Man cannot exist because they have no way of detecting him. The truth, however, is that he is simply too big to see. Work is necessary for production and thus essential, not only the material quality of one’s life, but even in order to live at all. Therefore, work, both professional and domestic, is one of the largest aspects of the human living experience – and rightly so. Work is so predominant and necessary that the mantra of most of the twentieth century was, in the words of Max Weber, “One does not only work in order to live, but one lives for the sake of one’s work.” The logical conclusion of the Industrial Revolution was that work for work’s sake was the end of human activity. It was in working and therefore in being useful that man found meaning in life. Men were meant to be functionaries, filling useful roles in society in order to provide for the needs of life and it was in this that man had purpose. Well, the Industrial Revolution got it wrong. Work and production are vital to daily living and the health of the economy and society at large but labor is not the end but merely a means to an even greater, more fulfilling end. We are not meant to work to work but instead it is our work that allows us, in the time that we are not working, to pursue what really brings us alive. Generation Y realized this and rebelled against the old mantra of living in order to work. However, it was a reactionary response on a grand scale that sorely missed the mark. Generation Y put their emphasis, not on their work, but on the free time that their labor allowed them. Yet, somehow, this has put society even further from true living than earlier generations were. In the eyes of society the following dichotomy exists: there are two states of living and they are work and time off from work “freeing” the worker to be idle. The first is characterized by activity while the second by inactivity. Generation Y chose inactivity. That’s not to say that Gen Y is lazy, just that they work so that they won’t have to later. Unfortunately, most of that sought-after free time is spent in passivity and “unwinding” from work. Consider that the average American household spends 8 hours a day watching TV – seven days a week makes that more than a full-time job. So, while both the workaholic mentality of industrial civilization and the reactionary response to it both constitute mindless activity the activity of focus of the former at least produces something useful while that of the latter produces nothing. 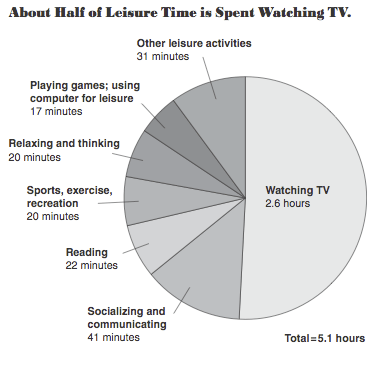 Most people will realize that that is far more TV than is healthy – but why is so much time spent in passivity unhealthy? Well, beyond the obvious physical ramifications of a sedentary lifestyle it is unhealthy and unfulfilling for the same reason that living to work is. Because both the work and the rest from work engaged in by society are lacking in really engaging the human spirit, because both share the common thread of intellectual idleness. Now, of course, some people’s work is largely mental but there is a significant difference between the productive mentality of the functionary who works with their brain and the genuine creativity of free thought not bound to a use or a wage. The real end that we must be striving for in life is not our work and it certainly is not entertainment – as addicting as it may be for so many. It is what the German philospher, Josef Pieper simply called “leisure.” Leisure, according to Pieper, was, in contrast to work, a “free” activity – meaning that, while leisure may be difficult does not constitute work. That is, it is not done because of its usefulness in producing some good or service but is a worthwhile endeavor in itself. In Pieper’s words it is the difference between the the “liberal arts” like philosophy, theology, painting, music or drama and the “servile arts” such as trades or many science-based academic majors like engineering or nursing. The former are forms of leisure and ends to be sought in themselves while the latter serves our work. Simply put, leisure is that purposeful (but not use-oriented) activity that seeks to broaden our minds and hearts, to expand us in our humanity. There are many activities that to some degree constitute leisure, but at its height, leisure is a festival: it is a celebration characterized by relaxation, effortlessness and ascendency. But, if “festival” is the height of leisure, what then is the height of festival? The transcendence of religious worship connects natural man to the super-natural – or even super-human – and it is in this super-humanity of the divine in general, but Christian divinity specifically, that man finds the ultimate leisure, because modern American culture, even its broad-spanning vein of contemporary secularism, is founded upon the bedrock of Christianity and, even should we attempt to ignore religion and instead adhere to some vague sense of spirituality in the name of secularism, Christianity is the basis of Western culture and the human experience as we know it.